But what about the another half of the dream? I have just finished a Chinese-character-input software tool - "Bridge2-Hi". With the Bridge2-Hi you can now input Chinese characters and write articles in the Chinese language with your normal keyboard. There is another Chinese version of this article (you can find it in my web-site) that is writen utilizing OpenOffice 1.4 with Bridge2-Hi 1.0. However this article is not a tutorial of Bridge2-Hi. Rather I will explain how how to prepare the operating system and how to setup the right environment parameters for various application software titles. Specificaly you will learn how to configure the options of various applications to meet the requirements of displaying and inputing Chinese characters in the right way. Now, let us get started! 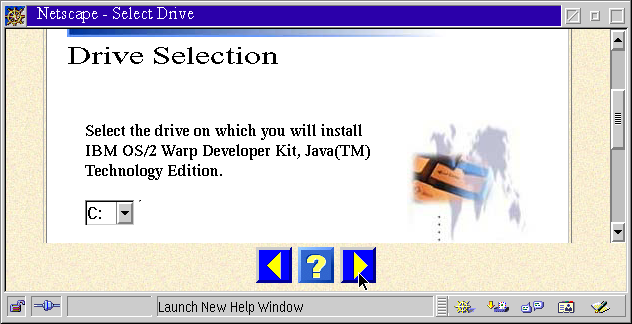 If you are using OS/2 Warp 4.0 non-Chinese version, you will need to install the IBM Java 1.18 Runtime. 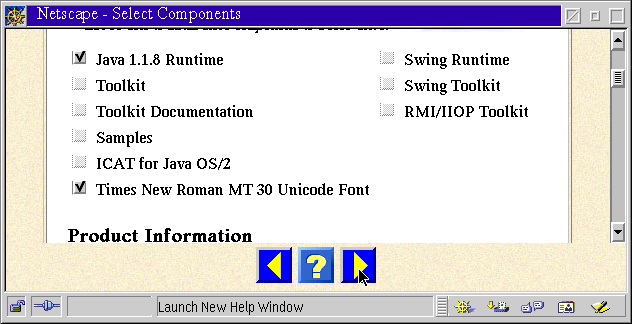 After installation of the IBM Java 1.18 Package, the operating system has the “code page” files and Unicode font - Time New Roman MT 30, which are the pre-requisite of displaying and printing Chinese characters. 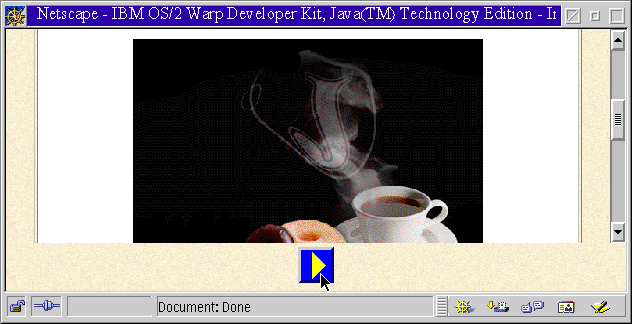 Unzip the IBM Java 1.18 software package with “-d” option into a temporary directory. 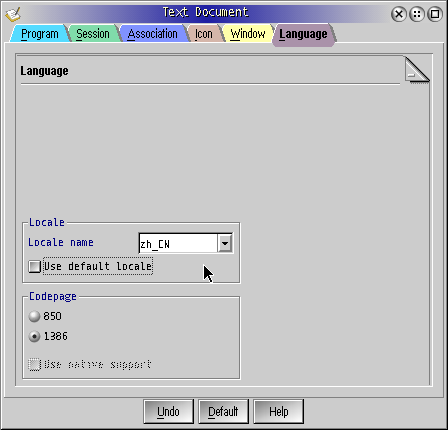 Run the "Install.exe” and the operating system will automatically load "Netscape” and pop up a "Language selection" interface with several push buttons. Please refer to following chart. Click the "start install" button to begin the installation. Note: After the modification, Codepage 850 will be the default codepage, it support American English and most of the western Europa languages; Codepage 1386 will be the backup codepage, it support Chinese GBK encoding. If you want to use BIG5 encoding, please change "1386” to "950”. Re-boot. 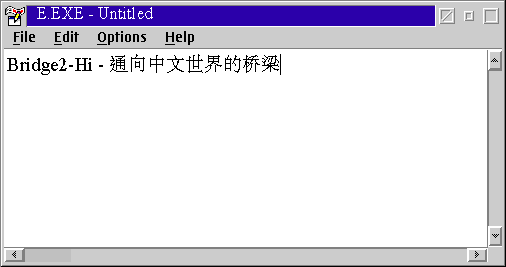 After reboot your OS/2 will be ready to display Chinese characters. If you have eComStation then you can install the Chinese language support components at the system installation phase. However if you select the default options when you install eComStation, the Chinese fonts can't be installed automatically. Of course you still have the opportunity to mount the Chinese fonts with the “Selective installation” function in the “System Setup” folder. At the installation phase: When you start the installation and go into [system component] selection phase, just select all “International fonts” and continue to finish the installation. So-called “running environment” is the operating systems environment parameters that can be set for a specific application software where you want to display or input Chinese characters. They are "LANG" and "Codepage” . 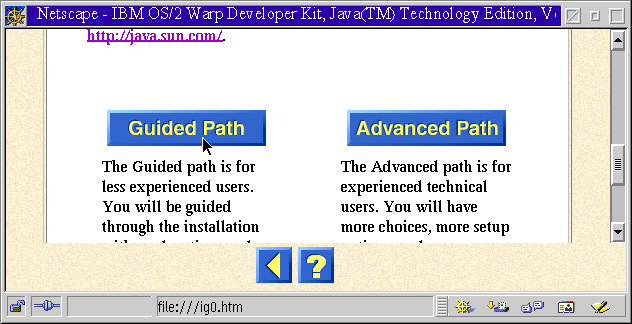 Let's have a look at how to configure them in OS/2 Warp 4.0 and eComStation separately. Here we will use the system editor – "E.exe” as an example. We firstly take a simple way which is mostly suitable for handling Chinese characters not very often. [C:\]set lang=zh_cn↵ ... set "LANG” environment as “People's Republic of China”. Now we will try another way: if you need to manipulate Chinese files frequently, it's better to setup a specific batch file (.cmd file). You can configure the environment parameters and load the application software in the .cmd file, e.g. E.exe. 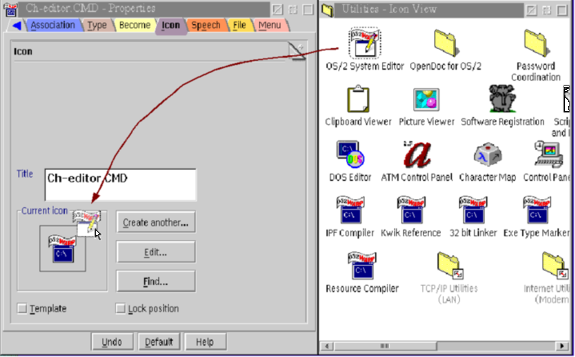 Open the desktop folder [OS/2 System]→[Templates], drag the icon of "OS/2 Command File.CMD” with the right mouse button to the empty space of the desktop, the operating system will then establish a .cmd file with name of "OS/2 Command File.CMD". Change the file name to an easy to remember word, e.g. 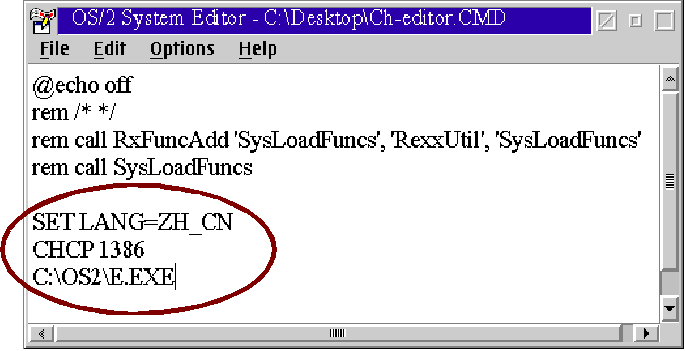 "Ch-Editor.CMD". Right mouse button (RMB) click on the icon of this cmd file, and select [Open as]→[OS/2 System Editor] from the pop-up menu. Save and quit the .cmd file. Now double click the icon representing the object E.exe and configure the display font like the method described in 2.1.1.3, you are ready to display and input Chinese characters. Open the desktop folder [Programs]→[Utilities], then right-click the icon “Text Editor” and open [Properties] setting pages. Then you will see there is a label [Language] at the right end of the pages. Open it. Close [Properties] setting pages and click “Text Editor” and then set the display font with the Unicode font according to the introduction of paragraph 2.1.1.3. Now I will provide a summary of how to handle Chinese words and file names in some tested applications. Generally speaking, as long as the software itself support DBCS, you will only need to set the correct Unicode font in the software. Full support. Don't use "set lang=zh_cn", otherwise bookmarks with Chinese word can't be correctly displayed. Full support, but Chinese file name can't correctly displayed. Note: It's better setting “Default languages for documents” of Asian to “Chinese(simplified)”. You can find the setting at [Tools]→[Options]→[Language Settings]→[Languages]. Full support, however you may use the Font Palette to set Chinese display font of file-open dialog, search dialog and etc. Support Chinese word file name. Full support, however the first character of text in a rectangular must be "space" or Ansi character. Full support, however you may use the Font Palette to set Chinese display font of file-open dialog, support Chinese file name. Full support, even you can save and open files with Chinese file name without any further setting. Full support. However the first character of text in a rectangular must be "space" or single-byte character, and you must use "font platte" setting Chinese font for the text input dialog every time you active it. Full support Chinese file name. You can use "font" setting page to select Chinese font for the display of "window" and "panel". However if you use pop-up dialog e.g. Copy/move, and want to handle Chinese file name, then you should set Chinese font by "font palette" every time you open the dialog. Full support Chinese file name. You can select Chinese font for every display component of Larsen Commander. However if you use popup dialog e.g. Copy/move, and want to handle Chinese file name, then you should set Chinese font by "font palette" every time you open the dialog. Can only support displaying the Chinese word, but the cursor moving behavior between Chinese words is not correct. Doesn't support displaying and inputing Chinese word. Legend "+" means the setting is obligatory. Legend "-" means you must not make the setting. Legend "*" means the setting is option and it seems the setting doesn't influence the behavior of handling Chinese word. 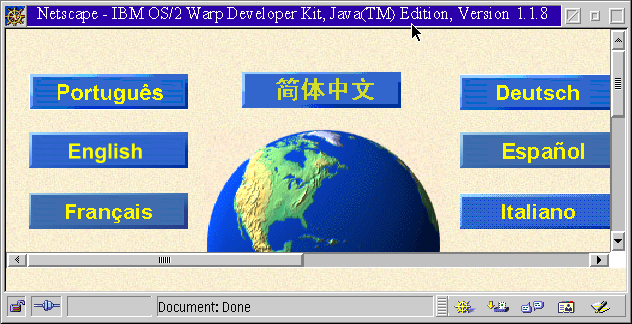 In OS/2 Warp 4 or eComstation 1.1, most above applications will show a message dialog with some words like "failed to initialize the help file" at the starting period, that means you could not have the online help function after you set the environment parameters for handling Chinese word. Fortunately this problem dispears in eComstation 1.2.